Like it or loathe it, MMA is a sport that is exploding all over the world. The documentary Fightville (2011) takes a look at a side of the sport far removed from the bright lights and big money of the UFC. The film takes a very focused approach, honing in on two fighters – Dustin Poirier and Albert Stainback as well as their coach, UFC veteran Tim Credeur. The other most prominent character featured is that of local promoter Gil Guillory. I think this narrow focus of the film is its greatest strength. This is no history of the sport or state of the nation. Rather it is a glimpse of small time MMA and the kind of people who participate in it. 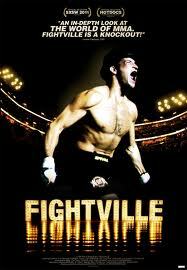 Fightville does a really good job of capturing the journeys of those involved in a pretty short period of time. You get a sense of the background of the fighters, why they are involved, the desperation and desire that rests within them. It also shows the scope of people who fight MMA, from dudes who just love to punch face, those who do it because they need the money and they are good at it, all the way through to those who pray before the fight that no-one, their opponent included, is hurt. Many of the fighters are actually a combination of more than one of those things. It is interesting to see the redemptive power of fighting for many of those involved in the sport. Particularly as on the surface to fight appears to be the opposite of redemptive. It seems to be about tearing down, not redeeming. But it is the training, the sweat and the sacrifice that are the redemptive aspects of it. Indeed many docos are about the redemptive power of something and Fightville is no different. The film is also really good at exploring the creativity that is inherent in jiu-jitsu and all of MMA more broadly. On that note it succeeds in bringing to life a different aspect of the sport that many people would not be familiar with. It is nice to see a documentary like this not take itself too seriously as this well made film exhibits a light touch the whole way through. I can only really comment on the film from my perspective, which is that of a MMA fan, but Fightville is a really interesting and well made doco. I think it is one which will hold interest to those who are not fight fans as well, giving a glimpse of a really interesting aspect of this sport and more specifically the yearning and work of those who are trying to make their way in it.